As I get ready for this holiday season, I think of what in my life I am grateful for. My family and friends are always the answer. That's why I think there is no better way to show my appreciation than to host a Friendsgiving! It’s that perfect time of year, fall is in full swing and the line-up of monthly events brings friends & family to your door. Here is how to host a most sumptuous meal for a warm & spooky night with close friends. We know finding the perfect gift for someone is hard so we are offering our favorite gift ideas for this holiday season! With Thanksgiving and the holidays quickly approaching, I was on the hunt for a great holiday cocktail that puts me in the spirit. With just a little apple cider and a little bubbly.. you have perfection. It's here!!! And if you are anything like us, Halloween done and snuck up on us this year! We're in the spirit, we swear. So we've compiled our favorite Halloween items out there- still available to help you get in the spirit. A FIG-Ment of the Imagination - A dish to tantalize your tastebuds full of mascarpone, honey, fig and sugar, This food recipes from Cara at @cara_melized is perfect for any Halloween Party. Today we thought it would be fun to share some content from our blog. We love to blog about some of our own personal creative outlets! Leah, of Color Pop Events based in New York City, was planning her friend's "unmentionable" birthday and flying out with a few girlfriends for the weekend - so we took the opportunity to share this California adventure with you! I'm always trying to think of ways to dress up drinks, especially when you’re having summer parties! These summer fruit infused ice cubes are the perfect addition to any cocktail, mocktail, or just plain old water. Summer is here and with that comes backyard BBQs with family and friends! BBQ's are definitely one of my favorite summer activities and whether you are hosting or attending, it's always great to have a handful of side dishes to satisfy guests. That's why we've pulled together 10 of our favorite BBQ side dishes from one of our favorite sites and magazine: Real Simple. Shindig Chic + Mary Costa Photography teamed up for this minimal bright styled shoot featuring everyone's favorite flower: peonies! We wanted to show how peonies could be incorporated into all aspects of entertaining - perfect for any bridal shower, brunch or birthday. It's June! Which means BBQs, hot summer nights and lots of laughs with friends. And what pairs well with hot summer nights with friends? Nice, lovely, refreshing cocktails! That's why we pulled together ten of the top cocktails for summertime! We love workshops. Not only do you get to learn new skills and explore new creative outlets; but you also get to network and meet new people. I am a firm believer in always having beautiful fresh cut flowers around your house. I like to have them on my desk, kitchen table, bathroom, etc. It's a cheap way to light up and decorate a room. Everyone loves fresh flowers and I have a few tippity tips for you gals on how to put together the perfect Spring bouquet. It's Cinco de Mayo AND Taco Tuesday?! Our little Southern California hearts are filled with joy at the thought of our favorite Mexican traditions (and food!). So we thought we'd round up all our favorite Mexican influenced posts from the past year to celebrate this festive day! With Mother’s Day right around the corner, there’s no better time to let our fabulous moms know how much we appreciate them. A personalized gift box is a great way to thank them for all they have done! If you are looking for a creative and inspiring brand that brings some energy and sparkle into your life, look no further than Studio Mucci. As a design firm focused on these very things, Amina's designs bring a little bit of whimsy into your every day life. This time of year can be crazy for a lot of us! With cold/allergy season still around, deadlines to be met, summer planning, whatever it may be, sometimes you need a freaking break to relax and de-stress. Especially for you Coachella heads! I love Easter! It’s such a colorful, happy holiday usually filled with brunch on the beach, family, and too many grapefruit mimosas! I tested these out a few weeks ago and Oh Ma Gah, they were so good!! Not too sweet, the perfect amount of carrot(ness) and were the ultimate Easter desert! 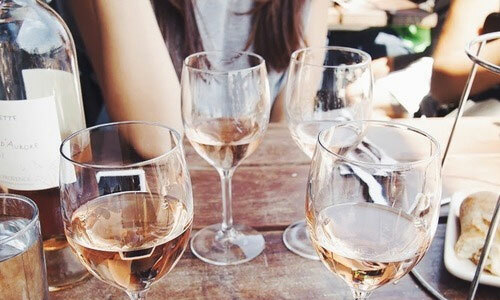 The ultimate day for any girl always includes a glass of wine (or bottle.. let's be honest). That's why we've pulled together some of our favorite Wine Lovers's items from all over the internet. Because... wine not? !